We are so excited to return to our roots . Joy was raised in Eunice & Ted was raised in Elton. We truly feel as though God has blessed us to be able to return to this area. A few years ago while preparing for our daughter's wedding, we developed a passion for rustic and vintage things. We have always loved antiques. We also enjoyed watching the details of the wedding come together. Hailey got married to Philip a little over 2 years ago. After their wedding, we had a dream to one day own a venue, but never thought it would be possible. When this property became available, it was a dream come true for us as we enter this new phase of life and our marriage as young empty nesters. The property that we purchased includes what was formerly known as Grand Pere Guesthouse (1920) (some of you may remember it as the Seale Guesthouse) & The Chapelle Country Store (Circa 1886) & Cottage. Please reach out to us for your Wedding or any special event that you may have in mind. We would love to be a part of that special day or event in any way that we can. We have many options with this property to offer and we allow outside caterers. Outdoor & Indoor options available. This Historical cypress building is ideal, especially if you are looking for a vintage or rustic setting. There is an indoor or outdoor option for a wedding (covered wrap-around porch in case of rain). The front part of the store is like stepping back into the early 1890's, still has original counters, these are perfect for serving lines for the reception. This store was the site where the last attempted robbery of Bonnie & Clyde took place in 1934. The rear of the store opens into a wide open hall which is ideal for the ceremony, reception, & rehearsal dinner. Outside caterers welcome!! 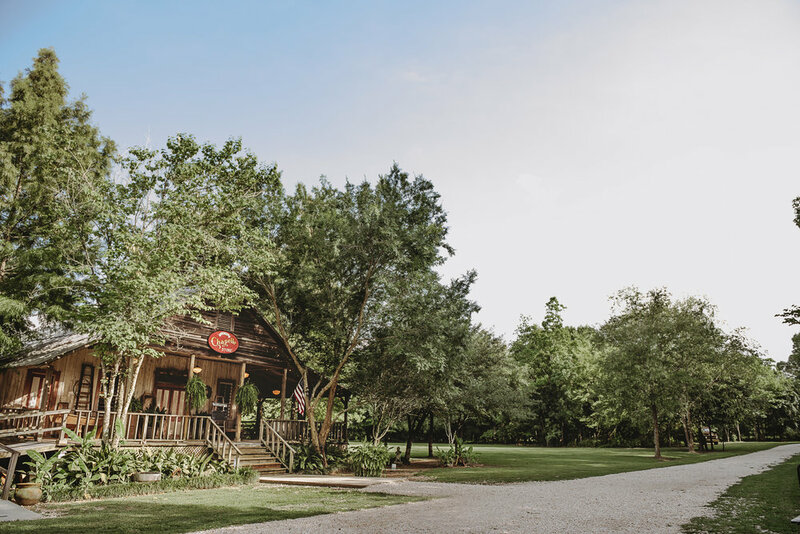 Cypress Grove has a few housing options available in addition to The Old Chapelle Store, (which is the Venue)- There is a completely renovated Cottage on the property that gives you the option of a Bridal Cottage. There is also a bordering B&B that sleeps 10 people. There is also an adjoining small Prairie Barn that is across from the B&B that is a great hangout for the Groomsmen. It also can be used for a rehearsal dinner. Our day rates are for 2 entire days with a load out option on Sunday at no charge! (no limit on hourly use for the 2 days) We also include tables (Farmhouse tables and rectangle tables) as well as chairs. We offer a significant discount for a 2 day rental to help you get in early and/or doing a rehearsal dinner on site! We have a kitchen in the Venue that we give you access to serve out of. We allow you to bring in your own caterer, even if its a family member at NO CHARGE, or we have a list of preferred caterers if you need one. The Cottage @ Cypress Grove was just completely renovated and makes a great Bridal Suite or Cottage for lodging. You can use if for overnight lodging or for day use. Built in 1886, The Old Chapelle Store has a rustic, vintage feel. In addition to the above, the neighboring property Le Village offers a turn of the century home that serves as a Bed & Breakfast to house many of your family or guests.